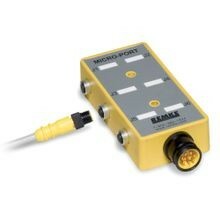 Remke Micro-Port™ & Mini-Port™ Distribution Boxes consolidate up to 12 connections into a single base unit. 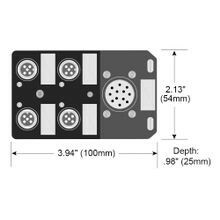 Using these boxes enables you to change components in seconds and conserve space by utilizing a single cable connection to your control system panel instead of up to eight separate cables. All Remke distribution boxes are designed to eliminate the need for knockouts and terminal strips so that wiring errors won’t occur – saving you both time and money during installation and maintenance. 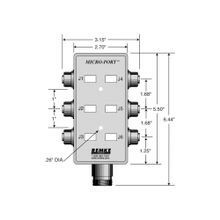 Products typically used with Mini-Port or Micro-Port distribution boxes include: 8mm-12mm-or 18mm proximity sensors, limit switches, solenoids and miniature controls. Remke Engineered Solutions is entirely focused on meeting the needs of a single customer. Our Job #1 is to develop application-specific, custom MICRO-Port & MINI-Port Distribution Boxes that meet precise specifications. Transform stock connectors with slight modifications, adaptations, and variations or manufacture custom cord grips.